It's possible that some of those participating in the poll were using that more intuitive method when making their predictions. Possibly. But I think most people base their vote on the September monthly extent values for previous years. 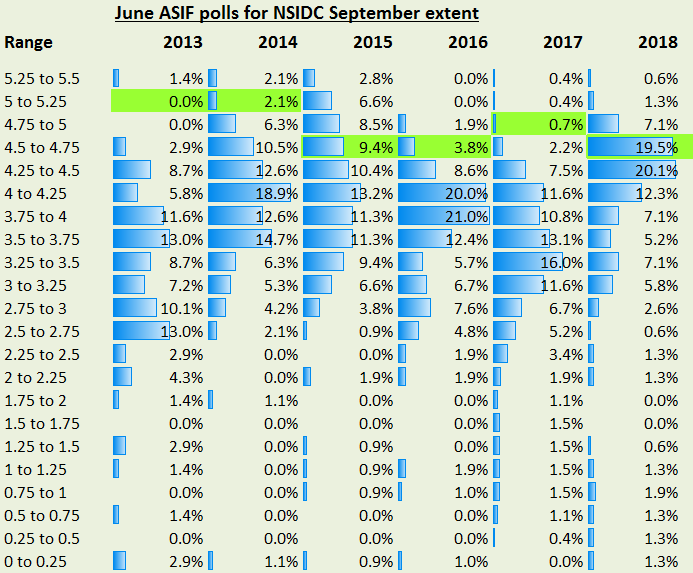 The choice of methodology used by NSIDC affects the monthly values for previous years too, so people probably adjust their expectations to it. Not that it matters much. It only affects the bins for the 2013 and 2014 September extent. For the other years the bin remains the same for the old and new version. 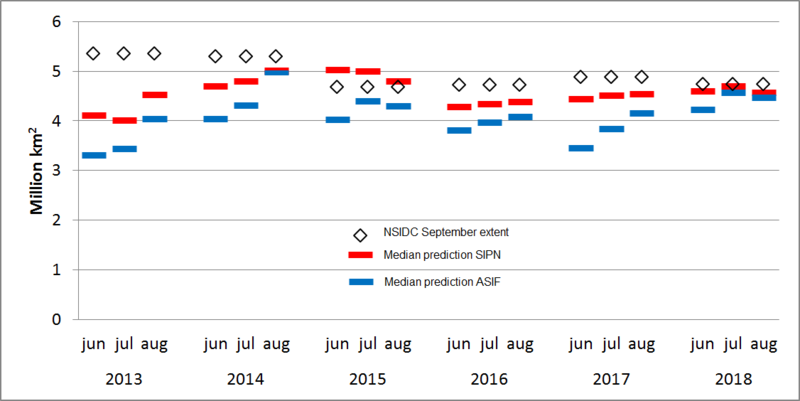 My graphics above would change as follows when using the revised NSIDC September extent values for 2013-2017: https://i.imgur.com/Q1lgGeN.png, https://i.imgur.com/3jnsLn4.png. Way back in late May / early June my thought was simple - 2017 extent loss really low because of cool cloudy summer, if 2018 is even a little bit more "normal" extent at minimum must be a good bit, say 250k+ lower than 2017, what with the late Feb early March warmth bomb weakening ice formation / thickening at a really cold time of year. I was right. My timing was off, is all. Jaxa SIE at 30 Sept is 309k less than 2017 on that date. So what is a mere 9 days? I claim a prize for being wrongly right or rightly wrong. How fast jaxa will hit x m km3 or when (if?) the barrens will freez or hit some number that means it effectively froze? The october average? the discussions / justifications are always facinating. Thanks for doing this, Steven. As always, your "variant" of my graph is better and nicer than the original.